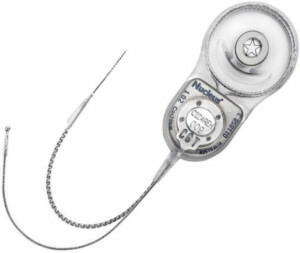 SILVER SPRING, MD–A new hybrid cochlear implant system that combines the functions of a cochlear implant and a hearing aid received clearance on March 20 from the U.S. Food and Drug Administration (FDA). Developed by the Australian company Cochlear Limited, the Cochlear™ Nucleus® Hybrid Implant System is the first solution designed for adults who have severe or profound sensorineural hearing loss in the high-frequencies but who can still hear low-frequency sounds with or without a hearing aid. The cochlear implant part of the hybrid system consists of an external microphone and speech processor that picks up sounds from the environment and converts them into electrical impulses. These impulses are transmitted to the cochlea through a small bundle of implanted electrodes. The hearing aid portion of the device is inserted into the outer ear canal like a conventional hearing aid, and can amplify sounds in the low-frequency range. Before giving the new product market approval, the FDA evaluated a clinical study involving 50 individuals with severe to profound high-frequency hearing loss who still had significant levels of low-frequency hearing. They were tested before and after being implanted with the device. A majority of the patients reported statistically significant improvements in word and sentence recognition at six months after activation of the device compared to their baseline pre-implantation performance using a conventional hearing aid. Representatives of Cochlear Americas will be discussing the new product this week at AudiologyNOW!, the annual convention of the American Academy of Audiology, which starts March 26 in Orlando. Among those explaining how the system works will be Chris Smith, president of Cochlear Americas; J. Thomas Roland, MD, of the Cochlear Implant Center at New York University Langone Medical Center, which was one of the centers conducting clinical trials; and Ellen DeVoss, a Nucleus Hybrid System recipient who participated in the clinical trials in St. Louis.